Margot Robbie's Harley Quinn steals the show from Suicide Squad, but to be honest, it's not exactly a heist worthy of Danny Ocean. The latest mashing together of disparate DC comic properties — just months from the wake of toxicity generated by Batman V. Superman — is a near-complete failure of conception, casting and execution, a disastrously incoherent mess of shadowy machine-gun battles that don't take advantage of, and don't seem to understand, the characters at play. The origin story doesn't get the team off to a strong start. Typically this "villains assemble" version of the superteam would follow these characters' establishing arcs in other successful DC properties — ones that would outline some beef Killer Croc (Adewale Akinnuoye-Agbaje) has with Aquaman, for example, or introduce the therapist-turned-sidekick arc of Harley Quinn's relationship with the Joker in a Batman film that actually featured Jared Leto's Hot Topic "punk." Instead, the Squad is introduced by intelligence officer Amanda Waller (Viola Davis); in making her case that, in a metahuman world, the government needs a metahuman defense team on hand, she roll-calls the gang over a dinner table as we are introduced to the primary's back stories. Deadshot (Will Smith) is the world's greatest shot, loves his daughter, and is a bore of a character they're wasting Will Smith on; Harley Quinn (Robbie) treated Jared Leto's Joker as a therapist before she cracked up and joined his crusade; June Moone (Cara Delevinge) is possessed by an incredibly powerful witch called Enchantress; Diablo (Jay Hernandez) is a tatted-up gang-banger trying to go straight instead of blowing up city blocks with his explosive fireball powers. Then there are the Hawkeyes (after the silent treatment Jeremy Renner's archer received in The Avengers) — characters who are barely introduced, barely present and in some cases, may have ended up on the cutting room floor: Adam Beach's Slipknot doesn't speak two sentences; Karen Fukuhara's Katana doesn't get much more; and to be honest, looking at the film's IMDB page, I'm shocked to see names like Panda Man (James McGowan), Frost (Jim Parrack), Monster T (Common), Boomerang (Jai Courtney) and The Flash (Ezra Miller). They may well be in this movie — that I don't recall seeing any of them indicates how strong an impression was made if they remained in the final cut at all. Let's leave aside that this necessary evil, literally, is assembled "in case" without any real threat being posed — and is in fact the cause of said threat — and let's ignore the fact that they exist in a superhero world without superheroes (those are coming in the form of upcoming DC properties surrounding Wonder Woman, Aquaman and the rest of the Justice League), creating a cart-horse problem this film can't overcome, there isn't an interesting story being told from this assemblage of colourful characters. The powers disparity — Diablo can blow up a city block while Harley Quinn carries a baseball bat — is glossed over by turning all the action into machine-gun battles against literally faceless blob creatures of unexplained origin. With most of the film shot in dark shadows, the details of who's shooting what aren't apparently relevant. Are there positives to be gleaned from the Suicide Squad experience? For Torontontians, it's certainly fun to see a city block literally outside the theatre where you're watching the movie. 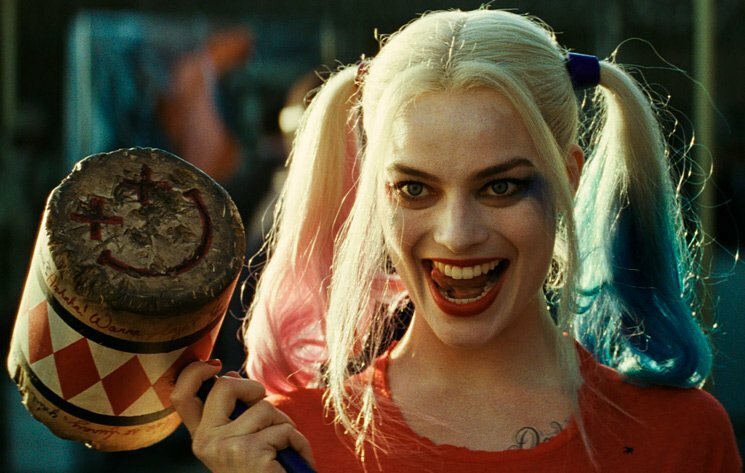 And Robbie's Harley Quinn is hands down the breakout star of the film: the only fun, outlandish delight to be found. The fact that her character will launch a thousand Halloween costumes may unfortunately make you sick of her by October.